By now most folks have heard of the new Microsoft Surface ( http://www.microsoft.com/surface/ ). In case you’ve been busy organizing your Star Wars figures, Microsoft Surface is a technology that lets you interact with the top of a coffee table sized device, as if it were a touch screen. You can draw on it, write, move the windows around and resize them. It also has the ability to interact with wireless devices. In one demo, a camera is placed on the Surface and the pictures appear to spill out onto the top of the table. Multiple people can “grab” these, spin them resize them, move them around to the delight. What’s interesting though is the level at which people seem to want to take this. I’ve seen numerous blogs and websites exclaiming how they can finally have their “Tron Desk”. In case you don’t recall, Tron (http://www.imdb.com/title/tt0084827/ ) was a 1982 movie in which Jeff Bridges gets sucked into a computer and has to play games to escape, and TRON is the program that can stop the bad guy. In the “real world” the bad guy (Ed Dillinger, played by David Warner (above)) has a really cool desk. The monitor is built in, as is the keyboard. Dillinger types on the flat surface of his desk as lighted keys appear under his fingers. Of course in 1982 it was a mock up, but today we do have the technology to do that kind of thing, I recall some early personal computers of that era having flat keyboards, each key was just the slightest bump. Today, my PDA has a touch screen, I can use my finger to key in the password and manipulate the start menu. 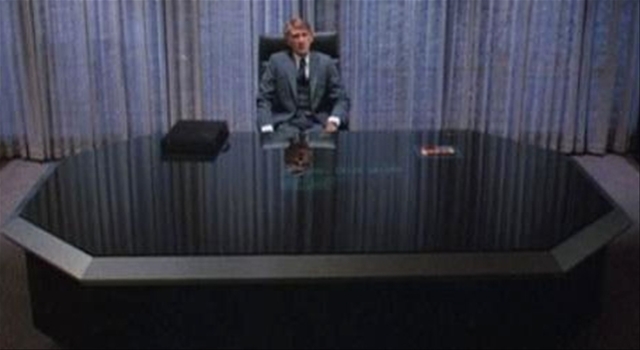 So if this is so cool, and do-able, why isn’t everyone using flat desks like the Tron one today? Well for the same reason that I think the Surface is going to see limited use: Tactile Feedback. Humans, at least for the time being, still like multisensory input. We like the feeling of the keys bouncing against our fingers, or the satisfying click of the mouse as we press it. It’s these tiny subtilities that we don’t think about that make the device usable, and largely unchanged since the inception. Sure, Surface will have it’s place. I can see it as a big conference room table, or on a conference room wall. Maybe in resturaunts, to place orders or ask for drink refills. But using the Surface as my desk? No thanks. Not unless it has a USB port for my keyboard! hi there, i just came across your blog on bing, and i would like to tell that you compose interestingly well on your web portal. i am actually struck by the mode that you express yourself, and the content is quality. anyway, i would also like to acknowledge whether you would like to exchange links with my website? i will be certainly more than happy to reciprocate and enter your link off in the link section. looking for your response, i would like to convey my appreciation and gooday!